“Transformation” is rapidly becoming the most overused buzz word in healthcare, unless you’ve been at it for almost half a century, at which point it moves from concept to proof points. We’re talking about hospitals seeking to improve quality care outcomes and do something about drug hyperinflation costs across the entire care continuum, enterprise-wide. Really doing something about it in a tangible way. Meet The CPS Effect. For nearly 50 years, Comprehensive Pharmacy Services (CPS) has served more than 700 hospital health system and retail pharmacy clients, delivering financial, operational and clinical excellence that helps pharmacies succeed. The largest provider of pharmacy support services in the U.S., CPS serves hospital, health system and retail pharmacies across the country and in Puerto Rico. 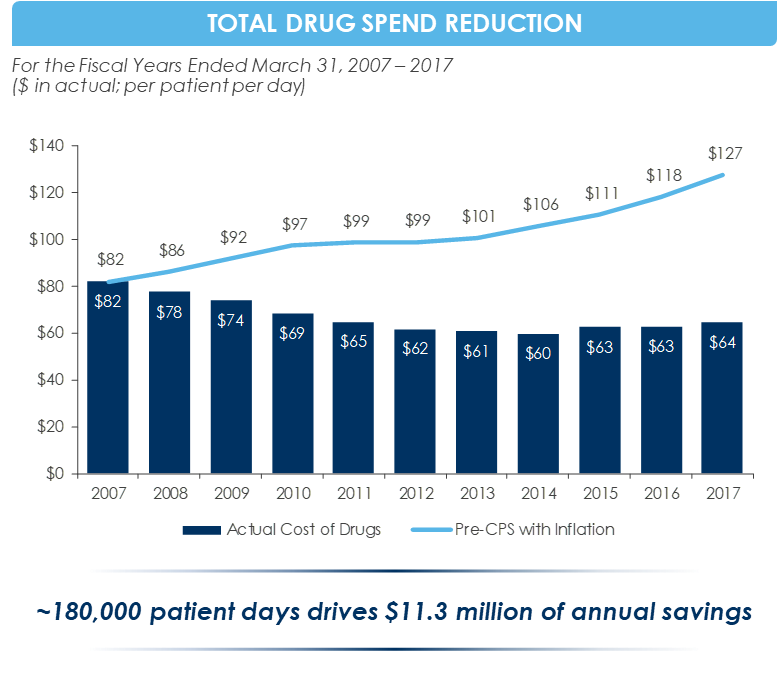 Yes, we manage drug costs in order to reduce the impact of drug hyperinflation and bring down spend for our pharmacy clients. But we do a whole lot more. Our cutting-edge technologies combined with our systems and team of more than 2,500 pharmacy experts positively impact the entire system of care. We call it the CPS Effect. Let’s look at some examples of how the CPS Effect rolls across the spectrum of care. We start with powerful analytics that deliver an unprecedented in-depth look into data and identifies opportunities for cost savings. Our industry-leading pharmacy monitoring platform, including the revamped RCA 2.0 technology, identifies alternate drugs that are lower in cost and clinically appropriate. RCA 2.0 also provides peer reviewed references that document that the alternate drug. Employing analytics like RCA 2.0 saves our client hospitals millions in drug spend every year. Systems like our CPS Telepharmacy Suite of Solutions function as a seamless extension of our clients’ staff, monitoring 3 million medication events a year. Using our proprietary technology, our team flags the wrong dose or wrong drug and provide real-time data on patients. We not only help improve patient care, but also positively impact the overall operation, resulting in fewer adverse drug events, readmissions and emergency room visits. Our exceptional team of 2,500 pharmacy experts know pharmacy like no one else. They live it and breathe it. Our experts dig deep into pharmacy operations, utilizing analytics-identified opportunities, and apply their expertise to recommend and execute strategies based on the data that deliver improvements operationally, clinically and financially. When it comes to achieving compliance for UPS <797>, <800> and 340B, CPS’ teams work hand-in-hand with the hospital’s pharmacy team to find opportunities for improvement. Together we draft and implement strategies to achieve compliance, mitigate risk and maintain a state of constantant audit-readiness. There’s no one delivering this level of success in pharmacy today but CPS. Let us show you how the CPS Effect can transform your pharmacy operations and help you succeed in today’s challenging healthcare environment.